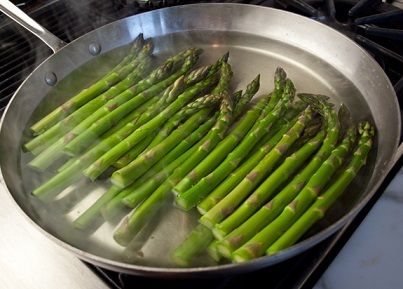 Actually there are several ways to cook asparagus, but this Asparagus Recipe uses a large skillet to blanch it. I remember eating asparagus that literally had the life cooked out of it. Totally limp - almost mushy. That was the way my mother cooked asparagus, or it was canned asparagus that was already cooked to death. Today, most people know better. At the restaurant we still occasionally hear someone complain that the asparagus is still a little crisp. But for the most part we have learned that the best flavor and nutrients come from not cooking most vegetables too long. 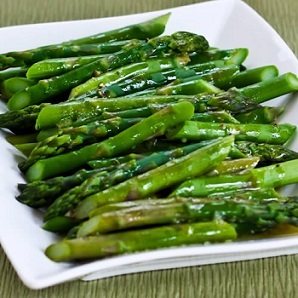 And one of my favorite vegetables is asparagus, especially when it is tossed in butter, regular butter or in a delicious Dill Butter or Lemon Herb Butter or even topped with a wonderful Hollandaise Sauce. When you go to the store to purchase asparagus, look for firm, fresh, spears with closed, compact tips and uniform diameter, so that all spears will cook in the same amount of time. “Thinner” stalks are best. 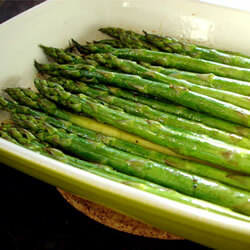 You can serve the asparagus with a lemon wedge to squeeze some lemon over the vegetable if you like. I also like to put some freshly grated Parmesan cheese on asparagus when I'm feeling a little extravagant. Or I wrap a piece of prosciutto ham around the asparagus and then add some cheese! Enjoy your asparagus and the company of those you share it with. "Olive oil ... asparagus ... if your mother wasn't so fancy, we could shop at the gas station like normal people."